SPRINGFIELD – Chicago Police Department officials opted last minute not to send a representative to today’s Senate Public Health Committee hearing on CPD’s collection and use of information in the department’s gang databases. The use of gang databases to track individuals labeled as suspected gang members has been called into question in recent months. More than 128,000 people are in the department’s gang database, 95 percent of whom are people of color. Chicago Police Department officials notified the committee just hours before the hearing that they were no longer going to send a representative to answer questions because of legal reasons. 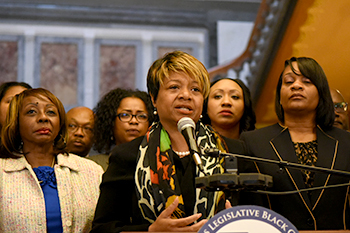 Representatives from the American Civil Liberties Union, Northwestern University Pritzker School of Law’s Children and Family Justice Center and the University of Illinois-Chicago, as well as concerned community members and activists, testified at Friday’s hearing. Van Pelt plans to introduce legislation aimed at reforming the use of gang databases. "I appreciate the governor's calls for bipartisanship, but he's spent the past three years pitting Chicago against the rest of the state, dividing instead of uniting. Rauner's actions over the past three years have led to chaos for our human service agencies, uncertainty in our schools and disproportionately hurt low-income families and people of color. It's time for the governor to stop placing blame on others and finally be the leader Illinois needs. It's time for him to stop campaigning and start governing."